Tring is a solid puzzler app for your iPhone, iPod Touch, and iPad. 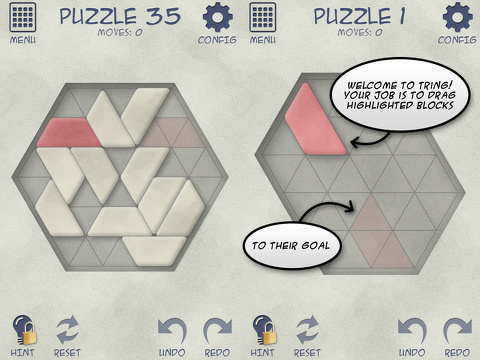 Instead of moving blocks and rectangles, you move a trapezoid within puzzles built by linking triangles together. Free from bells, whistles, and blinking lights, the Tring iPhone app is a workhorse puzzler. It opens straight to your first puzzle. Smart, precise pop-ups guide you through the gestures and rules of the game. You solve the first few puzzles using instructions and guidance, so you instantly rack up a few points with introductory tips. The puzzles for each level are shaped differently, but they are all formed from triangles. The piece you move to complete the puzzle looks like a pink eraser. The end location of the pink eraser is lightly colored in pink, so you can plan your strategy. The game board is a light gray, and there are white trapezoids that serve as obstacles placed around the board. You simply move the white pieces and pink pieces until you solve the puzzle. As you progress in levels, you may be required to complete the puzzle by successfully dragging more than one colored trapezoid to the desired location. You earn points by completing the puzzle efficiently. As a free universal download, 80 puzzles are available for you to solve on your devices. 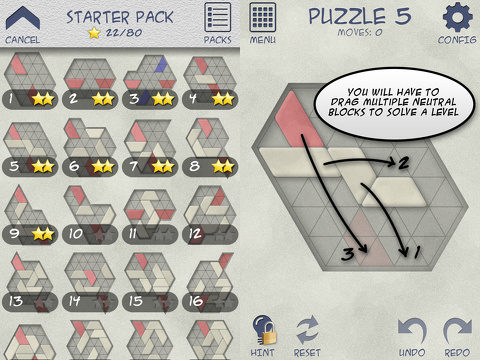 You can purchase packs of puzzles within the app for different skill levels like easy, intermediate, and expert. There are 200 puzzles in each pack priced at $.99 each. This is an interesting idea, as you can purchase a pack of easy ones for your kids and an expert set for yourself. You can also purchase hints. The Tring iPhone, iPod Touch, and iPad app is an appealing choice for puzzle addicts. The gesture controls are simple and effective, and the puzzles are challenging, yet still accessible to a range of users. The graphics are not as sharp as many might prefer, but the puzzles are well-crafted and fun. AppSafari review of Tring was written by Jenni Ward on December 4th, 2012 and categorized under App Store, Free, Fun, Games, iPad apps, Puzzler, Universal. Page viewed 4246 times, 1 so far today. Need help on using these apps? Please read the Help Page.